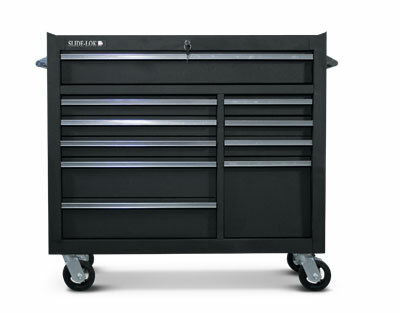 Width: 42" Height: 39.6" Depth: 18"
The Slide-Lok Metal Storage Chest is the perfect accessory for your Slide-Lok garage. Featuring ten drawers on smooth ball bearing slides with heavy duty swivel casters and double walled and welded 18 gauge steel construction, the Slide-Lok Metal Storage Chest is designed to handle just about anything. Lock down the SLIDE-LOK Metal Storage Chest with the integrated lock for secure storage of all your tools and accessories. Large side handle mounted on either side provides an easy grip while moving. Slide-Lok of Delaware Valley is an independently owned and operated business, which is an authorized Master Dealer of Slide-Lok's products.